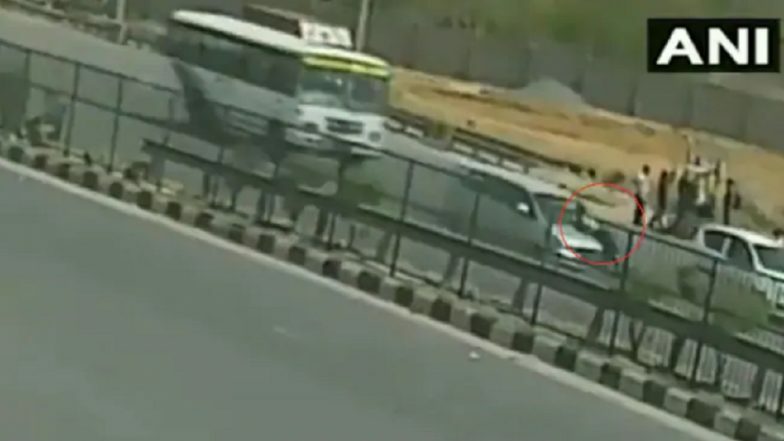 Gurgaon, April 13: CCTVs installed at the Manesar toll plaza captured a shocking incident of hooliganism on Saturday. A driver of Toyota Innova went past the toll booth without paying the charge. On being stopped by a staff member, the miscreant further accelerated the car, showing utter disregard to the life of the attendant. Ghaziabad Road Rage Shocker: Man Drives Car For 2 Km With Cab Driver Clinging On To Car Bonnet; Video Goes Viral. The toll staff member, who had a narrow escape, said he was dragged on the car bonnet for nearly 6 km. A search operation was launched for the miscreant, whose car numbers have been obtained from the CCTV footage. It was not clear whether he had been arrested by the time this report was published. "The driver dragged me for 5-6 km on his car's bonnet on a speed of about 100 km/hour. He said,'You'll stop my car?Even police doesn't stop my car'," the victim told news agency ANI.